I thought that this discussion might shed some light on how bioptic telescopes are named and what the names represent. As is well known, bioptic telescopes are available in two optical designs—Galilean and Keplerian. Each has its distinct characteristics and attributes. We prescribe them, of course, to support our patients’ range of distance-seeing needs and activities, not just for bioptic driving. Galilean telescopes are small and lightweight due to their rather simple optical design. They produce a bright image but offer rather narrow fields of view (about 8 degrees at 3x, 6 degrees at 4x) and tend not to be sharp edge-to-edge. They are available as both fixed-focus and focusable versions and are usually prescribed in 1.7x, 2.2x and 3x powers, but are available in higher powers as well. They are appealing physically due to their small size and low weight. Keplerian telescopes are longer and heavier as they incorporate prisms to reorient what would otherwise be an upside down and inverted image. They offer fields of view at least twice as large as Galilean telescopes (as much as 15 degrees at 3x, 12 degrees at 4x), but due to the greater number of optical components they can be less bright. They usually incorporate larger objective lenses to produce brighter images. All Keplerian telescopes are focusable, and are most frequently prescribed in 3x, 4x, 5x and 6x powers, though higher powers are also available. 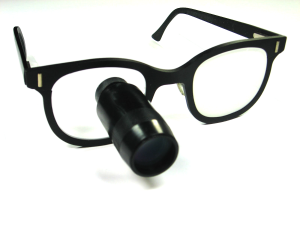 Two physical designs are available—one that extends forward from the eyeglass lens (Designs for Vision), and a second design that positions the telescope horizontally across the top of the eyeglass frame (Ocutech). As mentioned earlier, our patients seek help when they cannot see far enough away to perform the activity they have in mind. Otherwise they must move in much closer to see adequately, which may be inconvenient, impossible, or even impolite! Patients with 20/40 visual acuity, however, rarely complain of difficulty seeing. And, in virtually all states, individuals can be licensed to drive without restrictions with 20/40 visual acuity. Studies have also shown that in the classroom, children are unencumbered with that level of vision. It is reasonable to assume then, that if we can provide 20/40 visual acuity through the telescope, most patients would be reasonably satisfied with the functional benefit it provides. So, if the goal is 20/40, a 2.2x device should be adequate for an individual with 20/80 acuity, 3x for 20/125, 4x for 20/160, etc. If we prescribe higher telescope powers to achieve better acuity, it will be at the expense of a narrower field of view, which is the major complaint of telescope users. In addition, as telescope powers increase, image motion from head or vehicle movement is exaggerated, potentially undermining the benefit of the higher power. Clinically we find that bioptic users have increasing difficulty finding what they’re looking for when telescope fields of view become narrower than about 9 to 10 degrees. So, we always need to balance adequate acuity with the field of view. Personally, I prescribe Galilean telescopes for powers 2.2x and lower, and Keplerian at 3x and higher. There’s potential confusion regarding telescope product nomenclature as it pertains to field of view. Some Galilean telescopes that are called “wide-angle” do provide a slightly wider field of view than the conventional Galilean designs and some Galilean telescopes not labeled “wide-angle” may provide wide fields of view as well (see the chart below). However, Galilean telescopes will always have a narrower field of view than the equivalent power Keplerian telescope. All Keplerian telescopes provide “expanded fields of view” irrespective of whether their product name includes the “Expanded Field” nomenclature. So, a 3x standard Galilean telescope provides an 8-degree field of view, a 3x Wide Angle Galilean provides an 11-degree field, and a 3x Keplerian provides either a 14 or 15-degree field of view depending upon the manufacturer. Nomenclature becomes important especially when prescribing for bioptic driving. Some states require telescope powers to be no higher than 3x and that they be a wide-angle design. Some prescribers assume that this regulation specifies a specific commercially available Galilean “Wide Angle” bioptic product, when in fact and with confirmation from the state’s departments of motor vehicles, it implies only that the conventional narrower field Galilean design is not acceptable. In addition, several states require that bioptics intended for driving be non-focusable. Ocutech’s VES-Mini 3x Keplerian telescope is the only Keplerian bioptic that can be made non-focusable with a prescriber-adjustable setscrew. As a result, all Keplerian as well as some Galilean bioptics may be acceptable for bioptic driving—and, it’s the field of view that makes a telescope “wide-angle” and hence acceptable for bioptic driving and not simply the name of the product. Here’s a chart that presents the fields of view of the most common Galilean and Keplerian bioptic telescopes available today from two major manufacturers. Has a patient ever asked you what a field of view is? Here’s something I learned from my astronomy friends. Extend your arm completely in front of you with your hand bent at the wrist and pointing upwards. At arm’s length a hand subtends just about 10 degrees – each finger is 2 degrees. This will vary of course based upon how long our arms are and how wide our hands, but it’s a very good approximation of what a 10 degree field of view looks like. Happy stargazing! Field of View isn’t always about size. Here are 3 different 3x focusable bioptic telescopes with their fields of view! 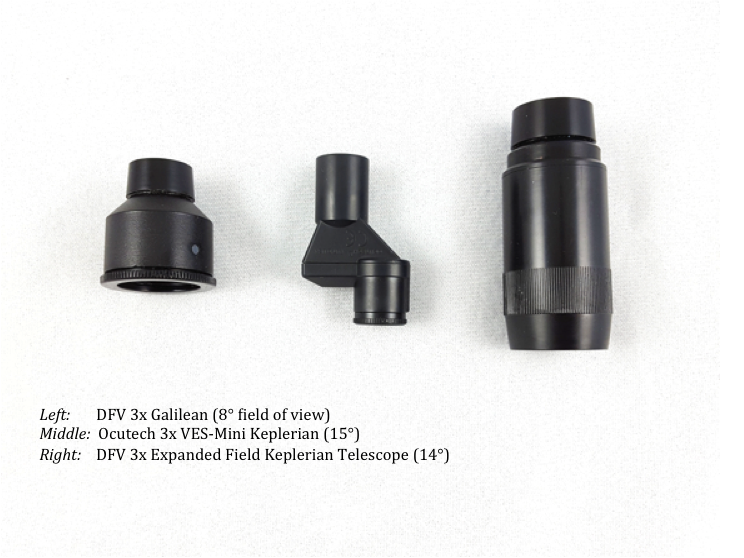 Ocutech’s 3x Mini Keplerian telescope (the middle one) is about the size of a 3x Galilean (left photo) but provides the field of view of much larger Keplerian Expanded Field telescope (right photo). And, now for the sales pitch. Why prescribe Ocutech bioptics? Not only for their wide fields of view, but also for their hi-tech appearance, light weight, wearing comfort and their ease of prescribing and fitting. And, they’re all appropriate for bioptic driving! Previous PostPrevious How do I choose the right telescope to prescribe?